Georgian Fire, like most porcelains is a large and beautiful garlic with rich robust flavor that is strong and has an aftertaste that lingers. 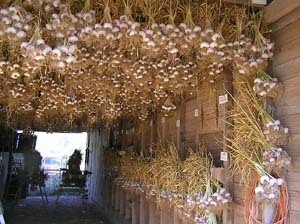 The clove covers are a light brown streaked with purple From a grower's perspective, it is a large and healthy garlic to grow and appears to be relatively resistant to most of the diseases that can affect garlic. It originated in the Republic of Georgia.